Drum Majors at Spain’s Málaga Open! 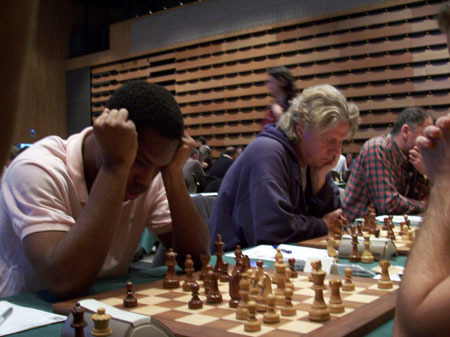 The Málaga Open kicked off in Spain and three players certain to add excitement to the event are IM Emory Tate (USA), GM Pontus Carlsson (Sweden) and GM-elect Amon Simutowe (Zambia). The three will join a strong field with three very different objectives. Tate is looking for a GM norm, Carlsson is looking forward to a 2600 ELO while Simtuowe is attempting to close the book on his GM title by gaining ELO points toward 2500. Tate will bring his swashbuckling style to the field and his games will no doubt attract interest. Carlsson has been in top form lately and has played more aggressively in recent tournaments with good results. His performance in Corus “C” was solid and he told The Chess Drum in an interview that he hopes to raise his level. Simutowe just arrived from Cappelle La Grande in France where he put in a 6½-2½ performance. He will arrive in Spain with an idea of playing good chess and from there he will compete in Reykjavik, Iceland. Let’s root for the Drum Majors! IM Emory Tate giving greetings in Spanish! 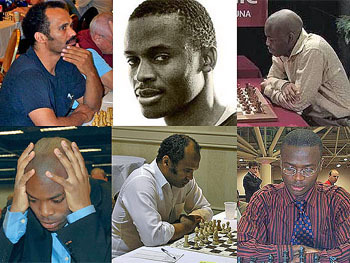 It would be great to have a tournament with the likes of GM Maurice Ashley, GM Pontus Carlsson, GM-elect Amon Simutowe, IM Emory Tate, IM Stephen Muhammad, IM Watu Kobese, FM William Morrison, FM Norman Rogers with perhaps IM Kevin Denny and IM Robert Gwaze. Simutowe will need to get his GM title officially so we could offer GM norms (need three GMs). This would be another historic tournament like the Wilbert Paige Memorial. The problem with having it in an Olympiad year is that non-US players will have to take vacation twice. Rising star Kayin Barclay has asked me about another “Wilbert Paige” and opportunities to help him and Jimmy Canty make National Master. Lot of possibilities. …but his opening experiment ran awry against the Polish Grandmaster. GM Pontus Carlsson pondering his next move at the MÁLAGA OPEN. The second Tate game featured above is an example of how NOT to play the opening in Chess wats the 3.Bd2 about??? Finally a good picture of Amon Simutowe… nice backdrop! Not a good shot of Emory Tate. Apparently not the intended target. Pontus Carlsson playing his pet Dragon. Wild game! Pontus wins again and is joint first on 6½-2½! He will play Tate is 5½-2½ and Simutowe is surging after four wins against overmatched opponents. He came in round four and can still end up with +3 before going to Iceland. Tate drew with GM Carlos Matamoros Franco and will end the tournament playing GM Manuel Rivas Pastor. 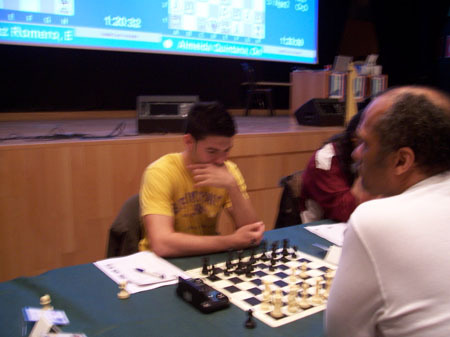 Carlsson plays an in-form GM Jedynak in the last round. Carlsson got joint 1st in the Málaga Open with an undefeated 7-2. A good performance for the rising star. He actually placed 2nd with the tiebreaks. Simutowe ended 6-3 after demolishing his weaker opposition in the last six rounds. Tate ended on +2 with a loss to GM Manuel Rivas Pastor. The game was very interesting after Tate maintained a slight spatial advantage, but then sacrificed and exchange for a passed pawn. Toward the end, Tate had drawing chances, but black’s passed pawn became a tower of strength. GM-elect Amon Simutowe gives a parting shot! Carlsson and Simutowe left Spain for Iceland to play in the Reykjavik Open: http://www.skaksamband.is/index.php?option=content&task=view&id=5752&Itemid=418 and also http://chess-results.com/tnr11080.aspx?tnr=11080 . Yep! Simutowe is looking to gain some points in a challenging field. 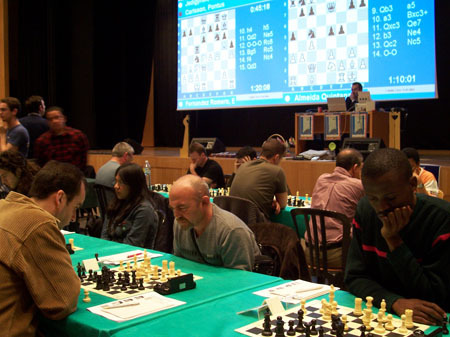 The field is lead by GMs Wang and Wang of China which is a refreshing occurance. However, Wang Yue lost in the first round to a 2300 ELO from Finland. I see Fabiano Caruana is there too. Maybe Carlsson can get his revenge from Caruana after losing to him at Corus “B”. You can check the ChessBase report here… scroll down. Tate got +2. Interesting that a 13-year old Indian boy named Anish Giri won the INTOMART GfK Open over seven GMs. They list him as being from Russia, but that doesn’t appear to be correct unless he moved to Russia to develop his talents. There is no way that “Anish” is a Russian name… it’s as Indian as curry masala. Here is one of Tate’s game… a win over WGM Anna Zatonsikh.